Want more peace and serenity in your life? Look no further than a mindful drawing practice called Zentangle. There are no mistakes and you don't have to know how to draw. The Zentangle workshops are great for folks who think they can't draw, can't meditate or just would like something to reset their brain after a busy or stressful day. 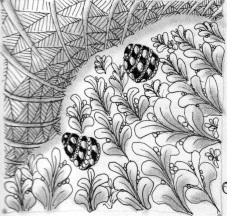 Zentangle is a process of drawing geometric or organic shapes within a structured space. Other than that supplies needed are only a pencil, pen and paper. If you want to go high tech, traditional Zentangle uses specific high quality pens, pencils and paper. No erasers allowed, as there are no mistakes. Drawing has been proven to lower blood pressure, decrease stress and increase feelings of self confidence and relaxation. I teach online and at various educational centers in the Western region of the United States. Drawing keeps the eye fresh, the mind alive, and intuition nimble.